With 12 returning starters and a rising star in sophomore quarterback Josh Rosen, the Bruins are the team to beat in the Pac-12 South. There’s some turnover among Rosen’s supporting cast, but UCLA has options at running back and receiver, and the offensive line may not suffer too much despite losing three starters. The defense struggled to stop the run last year, but there’s hope for improvement with the return of end Eddie Vanderdoes from injury. Additionally, defensive end Takkarist McKinley and linebacker Jayon Brown are two players poised for their best season at UCLA. USC might have more overall talent on the roster, but UCLA doesn’t have to play Oregon or Washington in crossover play and hosts the Trojans on Nov. 19. The edge in scheduling is a huge boost to the Bruins’ Pac-12 South title hopes. Josh Rosen is aiming to build upon an impressive debut season that earned him Pac-12 Offensive Freshman of the Year honors. The strong-armed passer threw for 3,669 yards and 23 touchdowns, although he did have 11 interceptions. 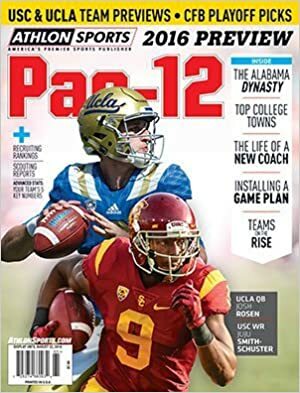 Rosen lacks the running ability of his predecessor Brett Hundley, so the Bruins will move from their spread offense toward a more traditional, pro-style scheme that is intended to cater toward the skill-set of Rosen, considered a likely first-round NFL Draft pick when he becomes eligible in 2018, and to better match up against physical teams. The backfield is deep, even with the loss of all-conference running back Paul Perkins, as Soso Jamabo and Nate Starks proved adept in backup roles last season, each averaging at least six yards per carry. But depth thins out from there for a group that ranked in the top 30 nationally in total offense last season (465.9 ypg). The receiving corps lost four of its top five pass catchers. Darren Andrews had 43 receptions, third-most on the team, and will pair up with top recruit Theo Howard and Eldridge Massington, who started nine games as a freshman in 2014 before seeing a limited role as a sophomore. Gone are also three of the five starters are the offensive line, including former four-year starting center Jake Brendel. Left tackle Conor McDermott is the key to the unit. Order a copy of Athlon's 2016 Pac-12 College Football Preview, which includes an in-depth look at all 12 teams, features and predictions for the upcoming season. Beset by injuries and apparently insufficient size, UCLA proved incapable of stopping the run last season. Three teams totaled at least 300 yards rushing against the Bruins in 2015, and the issue was accentuated in a Foster Farms Bowl loss to Nebraska, which totaled 326 yards on the ground. All-America nose tackle Kenny Clark, who was second on the team in tackles (75) and sacks (six), declared early for the draft, as did linebacker Myles Jack, who appeared in just three games before a season-ending knee injury. UCLA welcomes back defensive end Eddie Vanderdoes, lost for 2015 because of a torn ACL, and he should bolster the interior. The 6'3", 305-pound Vanderdoes was an all-conference honorable mention selection in 2014 after finishing with 5.5 tackles for a loss, fourth-most on the team. Leading tackler Jayon Brown, who tallied 93 in 2015, returns, as do linebackers Deon Hollins, a skilled edge rusher, and Isaako Savaiinaea, a sound inside linebacker. Star freshman Mique Juarez may come the closest to emulating Jack’s skill-set, though. All the starters are back from a secondary that should again be a strength after leading the Pac-12 in pass defense (203.2 ypg). Cornerback Fabian Moreau, who missed most of the year with a foot injury, also returns. Freshman JJ Molson, a native of Quebec who enrolled in January before spring practice, takes over for departed Lou Groza Award winner Ka’imi Fairbairn. He has a strong leg as well but no college experience. Another freshman, Austin Kent, takes over as the punter for Matt Mengel, who struggled to average 40 yards per attempt last season. The Bruins again have the talent to challenge for a Pac-12 title, a product of a succession of highly ranked recruiting classes over the last five years under Jim Mora. But they saw six early departures to the NFL Draft, the second-most of any program after Ohio State, with four of them on the offensive side of the ball. That puts a good deal of pressure on Rosen, who is talented but still has just 13 career college starts under his belt and is transitioning to a new offense. The defense, which returns eight starters, can help if it fixes its issues up front. There are enough pieces left that it’s easy to see the Bruins again factoring into a tight Pac-12 South race late in the season.